When I first stumbled across a rumour of an Adventure Gaming Expo in the UK, I dismissively put it in the back of my mind until freeware developer Infamous Adventures announced that they would be making an appearance to showcase their latest game. Intrigued, I clicked my way to the AdventureX site and found that the event was due to take place on the weekend of December 17-18 at Didcot Parkway. I chose to go on Sunday, facing the usual endless delays of getting around London’s decrepit weekend train/tube network, a lengthy coach tour to Oxford, followed by another train that (finally) arrived at my destination. By that time it was around 2pm, so I’d potentially missed out on half the action by that stage, but lucky for me things were only just getting started. 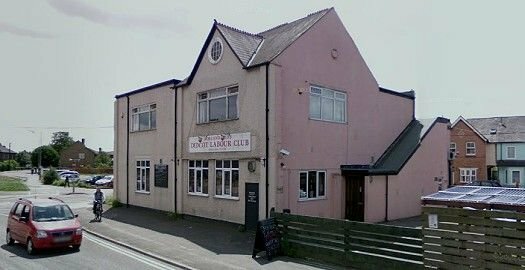 What looked like a washed-out old business depot was the Didcot Labour Club, a small local bar with a function room on the first floor. Trying to find an entrance to this building was a problem -- there isn’t one! Well, no front door at least, just a side entrance next to the beer kegs for what you’d expect to be the staff entrance. Fortunately, as I was exploring the downstairs area trying to find a way in, I ran into indie developer Mark Lovegrove (aka Screen 7), who showed me upstairs to the main event after a quick introduction. Mark was the main organiser of the event, and he highlighted the attractions coming up over the course of the day. For the most part it was meeting with other independent developers and trying out some of the latest pre-release adventure demos. Chris Jones, the creator of Adventure Game Studio (AGS), was there to give a talk, along with developer Alasdair Beckett-King, designer of Nelly Cootalot, followed by a pre-recorded message from Ben ‘Yahtzee’ Croshaw, well know AGS developer and reviewer (not to mention former Adventure Gamers staff member). In addition, many games either complete or still in development were being showcased on a large LCD Television at the front of the room. There weren’t many people there that day, and the event itself was fairly basic, with only a few PCs allocated in a room that was built for more musical events. This made it one of the more down-to-earth set ups I’ve encountered, and a welcome opportunity to catch the developers in a relaxed environment, with little or no pretension involved. Still, seeing that the event was a public expo, a little more showmanship and polish would have enhanced the venue – at least an effort to cover up the shabby curtains might have helped a little. Really this was a developer conference, however, which just so happened to be open to the public and probably shouldn’t have been labelled an expo on its first run. After chatting with some of the guys and briefly trying out a few AGS demos, I gravitated to what had become the event’s main attraction, Infamous Adventures’ Space Quest II remake, presented by the ever-gracious ‘Broomie’. Looking at the game in its final beta stage (it has since been completed and publicly released), I was suitably impressed by the obvious effort put into it. Released in 1987, the original SQ2 was a difficult keyboard-controlled adventure with basic EGA graphics and a minimalist soundtrack spluttering out from a PC’s internal speaker. About the only thing that makes the game palatable today is its parody of science fiction themes and sarcastic humour. It was a pioneer for the genre at the time, but when one goes back to this title using DOSBox, it’s barely playable now, with an outdated text parser that only manages to capture the most basic commands and an opportunity to die at just about every possible turn with its cumbersome controls, making you wonder how the game managed to be successful in the first place. The remake updates both the graphics and engine, successfully implementing a point-and-click interface that immeasurably improves the game’s playability. There’s also been a host of minor changes which ever-so-slightly modify the design without significantly deviating from the original version of the game. There are still plenty of chances to die, but this time around you are a bit more in control rather than fighting the parser and the keyboard to perform critical actions. Visually the game looks incredibly polished, and it’s now accompanied by an equally impressive soundtrack. I was pleased to get an early glimpse of it before it went public, but now that it’s been released, we’ll have more on the game in our next freeware round-up. No, sorry, not the Tex Murphy guy. This is the other Chris Jones, but certainly no less important. For anyone who hasn’t been paying attention, Jones is the creator of the one and only Adventure Game Studio, the freeware and now open source software package that has been the foundation of numerous adventure titles. So while many may not know his name, Chris has had considerable influence on all those who have used and benefited from his work. A programmer and developer from the UK, he just wanted to make his own adventure games and one day set out to build an engine for just such a purpose. After doing so, he released his software on the internet and lo and behold, an entire development community sprang up around him! Apart from a demo he created for AGS, Chris hasn’t actually completed his own adventure game as yet, as after a few attempts he realised this wasn’t his greatest strength and instead concentrated on making AGS itself better. Chris himself is a fairly low key individual, calm and relatively humble, more of a fan than someone you’d expect from someone who’s accomplished so much. This impressed me, as I was anticipating a more showy individual, agonisingly proud of his achievements, but instead here was someone relaxed, open, easy to talk to and perhaps even a little nervous about getting up in front of the crowd and being filmed. When he took to the stage, Chris offered some general insight into the history of AGS, which is now more than ten years old, and some ideas as to where it might be heading. Currently AGS is no longer under development and officially no longer being worked on by Chris. Instead it’s been officially released as open source software, so it’s now available to all to be enhanced and altered, should another developer decide to take up this challenge. There’s also some discussion of the possibility of a port to the iPhone/iPad/Android platforms. Whether this is completed by Chris or an outside party remains to be seen, but there’s general acknowledgement that it may be a good option for commercial developers, or for anyone wishing to port their titles to touch screen portable devices. It makes sense: adventure games seem like a perfect fit on mobile platforms, offering direct interactivity and reducing the need for higher-resolution graphics. Not that the latter is being ignored. Chris also put out a call to any interested developers to drive improvements, incorporating more features such as higher resolutions and removing some of the limitations AGS currently imposes. One of the questions I posed to Chris was whether he might commercialise AGS if it became available on mobile platforms, to which he responded with a no, stating that AGS will remain a free open source platform for all. It’s an honourable position, especially considering how many other tools involve a small cost or percentage for using them in commercial titles. It almost seems a shame that Jones will never benefit financially at all from his creation, but perhaps he relishes more the knowledge of what his efforts have done in bolstering the adventure gaming community. Without AGS, a large selection of indie games that we have available today just wouldn’t exist (or be nearly as good), and that’s something we can all be grateful for. Thanks for coverage! “take place on the weekend of December 17-18” makes me wish that there overview wouldn’t be already 1 month old though. But better late than never. Next time maybe also more previews of games. If in coming years this becomes more of a “real” expo, I’d definetly be interested in taking a trip to England to check it out. It would be preferable though if they tried being smart about it and organizing the event so non-british people can both attend this event and other entertaining events at the same time, what with the expensive planeticket etc. Like trying to get this up the same days as Eurogamer Expo is on would be awesome. Excellent coverage! Here’s to an even better and bigger Adventure-X next year! Well worth listening to IMO. For example, why they left Rincewind behind for the 3rd game and how they discussed Noir with Terry Pratchett. Shame it’s not the whole thing. But I’m glad you liked the coverage nonetheless! That was awesome, thank you! Awwww.. this is so damn cool. I smell the start of a big adventure game expo happening here. And man is Chris Jones cute. Very cool. Thanks Rob! And thanks for leaving out the part about winning a really crap prize…! !